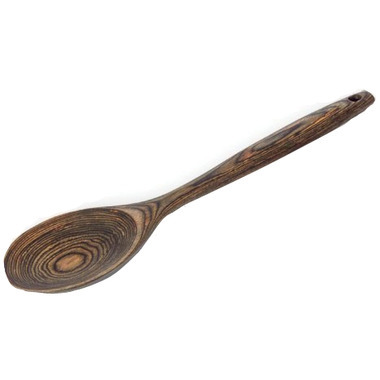 This Island Bamboo Black Paka Wood Spoon is an earth friendly choice for your kitchen. When I received this spoon, I fell in love instantly. It was beautiful and appeared to be of great quality. After the first use, the spoon was chipped in 3 different places. I was using it to stir soup and had to actually pick the bamboo fragments out of the soup. I will still use the spoon as it seems to have stopped chipping (perhaps it just had a few week spots?) and I spent money on it, but I am disappointed that this happened on the initial use. I also bought the wooden spatula in the same colour and have had no issues with it.